The scientist Philipp Lenard was a crucial factor behind Hitler's distrust of nuclear physics. Albert Speer, the Nazi architect and war minister, observed how his paymaster Adolf Hitler was “filled with a fundamental distrust of all innovations which, as in the case of jet aircraft or atom bombs, went beyond the technical experience of the First World War generation, and presaged an era he could not know”. Hitler was indeed involved from the First World War’s outset, having voluntarily enlisted to join the Bavarian Army in early August 1914. As a humble dispatch runner, Hitler was present at a list of major conflicts – from the First Battle of Ypres in November 1914, through to the bloody fighting at Passchendaele (July-November 1917), having recovered from injury to his left thigh during the 1916 Battle of the Somme, after a shell exploded close-by. At war’s end, with Hitler almost 30 years old, there was little indication he would evolve into a dictator set on colossal genocide of Jewish and Slavic populations. As with many First World War veterans, Hitler had a conventional, old-fashioned view regarding artillery and weapons. Furthermore, like many of those who survived the Great War, the hammering psychological impacts of the conflict remained embedded on the mind. “Even as a military commander, Hitler was inclined to think of the psychological rather than the military potency of a weapon. That was shown early when Hitler devised the siren for Stukas, and regarded the demoralizing howl as having a greater effect than the explosive force of the bombs. And this bias assumed strange and militarily-unfortunate forms when the sub-machine gun was ready for production – and Hitler delayed its introduction month after month because, he argued, the soldier’s use of the rifle forced him to become a good shot and bayonet fighter, and thus called for soldierly virtues”. “Such psychologizing of all military technology became sheer grotesquery, when Hitler begged Rommel and me to develop automatically-rotating flamethrowers, which would work in the manner of lawn sprinklers. These, he argued, would be the prime defense against [an Allied] invasion. Judging by Hitler’s experiences in the First World War, nothing was more terrifying to a soldier than a jet of flame aimed at him. The prospect of being burned to death spread panic, whereas death from a bullet always came unexpectedly and was more honorable. By the spring of 1944, more than 20,000 flamethrowers were produced and available… The objections of military analysts meant nothing to Hitler once he began ranting about the devastating psychological effect”. In relation to the possible planet-altering subject of nuclear weapons, by June 1942, at the height of the war, Speer noted Hitler’s “growing resolve not to pursue the matter”. 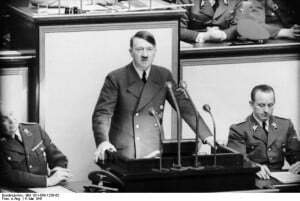 The Nazi leader felt atomic weapons could turn the earth “into a glowing star”, while he further joked that the scientists “might one day set the globe on fire” by their discoveries. The English author and Third Reich specialist, Geoffrey Michael Brooks, wrote that Hitler had a revealing discussion in November 1944 with SS lieutenant-colonel Otto Skorzeny (Benito Mussolini’s chief rescuer the year before). “even if the radioactivity could be controlled, and you used fission as a weapon, then the effects would be terrible… it would be the Apocalypse… No nation, no group of civilized people could take on such a responsibility. The first bomb would be answered by a second, and then humanity would be forced down the road to extinction”. 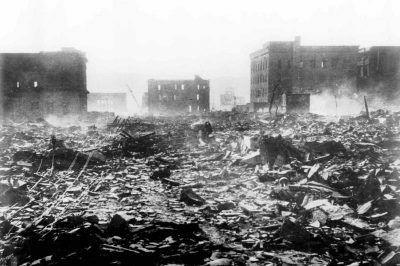 Almost, as it has proved, or not yet perhaps – as numerous near-fatal incidents with increasingly powerful nuclear bombs have occurred in the post-World War II period. Today, threat of global destruction from nuclear weapons is grave, as outlined by the atomic scientists who control the Doomsday Clock. The dangers were all too real from the beginning. In mid-July 1945 Enrico Fermi, the Americans’ chief nuclear physicist, was about to test the world’s first atomic bomb in New Mexico, when “he suddenly offered to take wagers from his fellow scientists on whether or not the bomb would ignite the atmosphere, and if so, whether it would merely destroy New Mexico, or destroy the world”. Such were the terrors afflicting him. In what must be one of the greatest ironies in world history, the leading Nazi dictator (Hitler) – unlike his democratically elected Western counterparts – foresaw, from quite early, the enormous threat nuclear weapons would pose to the earth. Unperturbed, by December 1942, US president Franklin D. Roosevelt had given “final approval” to build the atomic bomb, continuing its unwavering development even after it became clear, in late 1943, that the Nazis’ nuclear program was “stillborn”. Elsewhere, a further critical influence behind Hitler’s mistrust of nuclear research was his decorated advisor, Philipp Lenard, the veteran Nobel Prize winning physicist – and a supporter of Hitler dating to the 1920s. Discussing such matters with companions at dinner, Hitler cited nuclear research as belonging to “Jewish physics”, backing up his arguments by invoking Lenard’s racist theories. Hitler later appointed the German scientist as “Chief of Aryan physics”. “Lenard had instilled the idea in Hitler that the Jews were exerting a seditious influence in their concern with nuclear physics and the relativity theory”. With such an unrepentant anti-Semite as Hitler, Lenard’s words must have carried deep resonance. Einstein himself, who was born in southern Germany, unwittingly became one of the instigators behind America beginning their unrelenting nuclear program, called the “Manhattan Project”. Einstein signed a letter to president Roosevelt, sent on 2 August 1939, warning that the Nazis could develop an atomic bomb in the near future. Roosevelt replied personally to Einstein over two months later, promising he would “thoroughly investigate the possibilities of your suggestion regarding the element of uranium”, one of the key components in nuclear weapons production. Unfortunately, Einstein could not have been aware of Hitler’s full personality and anti-modernist nature, nor his distrust of nuclear research. In 1954, the year before Einstein died, he described his signing of the letter to Roosevelt as the “one great mistake in my life”. While Roosevelt, and successor Harry Truman, were firm advocates of nuclear research, Hitler’s mind was on anything but atomic weapons. By late summer 1942, his German forces were bludgeoning their way toward the southern Russian city of Astrakhan – with the aim of also taking oil-rich Baku, the capital of Azerbaijan. While Napoleon had been unable to last the Russian winter of 1812, the Germans were proving to have greater endurance. Though suffering significant losses, the Wehrmacht survived Joseph Stalin‘s counter-offensive of December 1941, before regrouping. “There actually no longer seemed to be any resistance to Hitler left in Europe”. Toward the end of August 1942 the Nazi leader met Speer, along with several industrialists, at his Vinnitsa Werwolf headquarters, in central Ukraine. “For a long time I have had everything prepared. As the next step we are going to advance south of the Caucasus, and then help the rebels in Iran and Iraq against the English. Another thrust will be directed along the Caspian Sea towards Afghanistan and India. Then the English will run out of oil. In two years we’ll be at the borders of India, 20 to 30 elite German divisions will do. Then the British empire will collapse. They’ve already lost Singapore to the Japanese. The English will have to look on impotently as their colonial empire falls to pieces”. “Napoleon wanted to conquer Russia and the world by way of Egypt. He would have reached his goal if he had not made great mistakes. I shall avoid such mistakes, depend on that!… By the end of 1943, we will pitch our tents in Tehran, Baghdad and on to the Persian Gulf. Then the oil wells will at last be dry as far as the English are concerned”. Amid his vast military plans, Hitler’s belief in warfare again remained rooted among his experiences of fighting in the trenches. His disdain of the machine gun extended upwards to his mistrust of jet propulsion, which he felt a major threat to classical aerial combat. The dictator consistently interfered with development of the world’s first jet-powered fighter aircraft, the Messerschmitt Me 262 – he delayed its production for months on end, until it was too late, while insisting it should be used as a simple bomber rather than as a fighter aircraft. Even in Hitler’s efforts to thwart a possible Allied invasion from France, his ideas were remarkably conventional and outmoded. On 20 April 1943, his 54th birthday, Hitler discussed with Speer and State Secretary, Karl-Otto Saur, how best to repel an American and British landing in the West: By designing six-man bunkers, equipped with just anti-tank guns and flamethrowers, which Hitler himself had just sketched on paper. “You see, I have to do everything myself. Nobody hit on this idea. Bemedalled generals, technicians, armaments experts surround me, but everything rests on my shoulders. From the smallest to the biggest! Here I am, 54 years old, and you can see the condition I’m in. But I’ll still have to lead the great clash with the USA”.